Our current director, Diana Appler, received her early musical training from the University of Oregon, graduating with a Bachelor of Arts in Music (80). Diana continued her musical development and training with over 25 years of service as a U. S. Army Band musician. She often held the position of principal clarinetist, with additional duties as Supply Supervisor, Music Librarian, Woodwind Quintet member and Platoon Leader. She retired in 2005 as First Sergeant/Enlisted Band Leader of the 56th Army Band stationed at Fort Lewis, WA. Her tours of duty include Fort Lewis, WA., Korea, Aberdeen Proving Grounds, MD., and Fort Sill, OK. Diana returned to college after retiring and completed her Master of Music degree in instrumental conducting from Central Washington University in March of 2012. She self publishes wind band arrangements and other music through J. W. Pepper and their MyScore services. 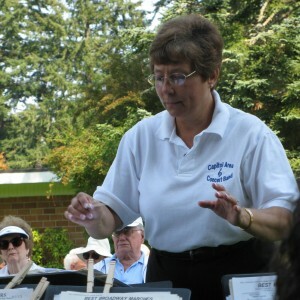 She resides in Lacey, WA with her husband of over 46 years who is also a retired Army Bandsman and Capital Area Concert Band member.